Stars Wars Death Star Kitchen Timer | Nerd Much? The Death Star, the huge space station originally created for mass destruction, has been shrunken down to fit right in your kitchen and on your countertop in the form of a Star Wars Death Star Kitchen Timer. The coil has to be in play to operate, so if you need to set the timer for under five minutes, you have to turn it to fifteen minutes and dial it back down to five, four, three, two, or one. Batteries are included. 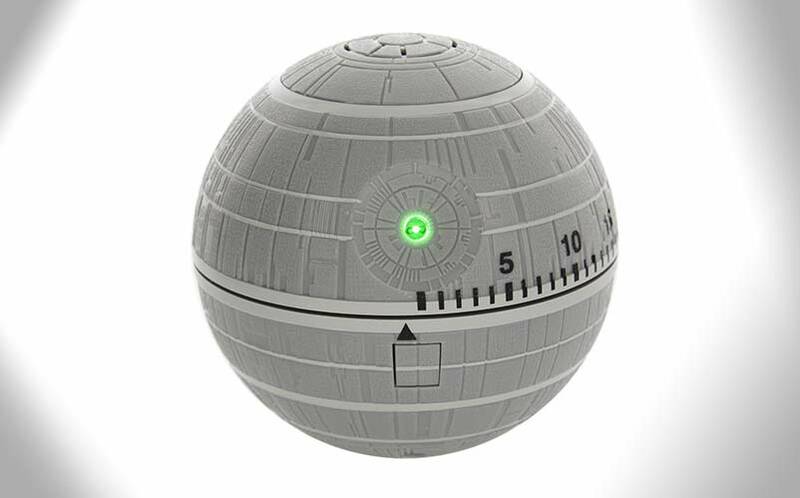 The Star Wars Death Star Kitchen Timer measures approximately 4 x 4 x 3.6 inches and weighs just over 6 ounces, nowhere near the size of the galactic fortress that it is modeled after so don’t worry, your kitchen is safe. This timer is handy for every baking nerd in the galaxy, and if you’re not a cook, you can use it to alert you for whatever needs to happen within the sixty minute time frame — homework, phone calls, nap times, coffee breaks, time to go to the gym. Hell, use it to weed out your friends by using it as a conversation piece, because let’s get real- if your friends think having a Death Star-themed kitchen timer is ridiculous, are they really worth hanging out with? For more cool nerdy stuff, stay tuned to Nerd Much? for daily finds.